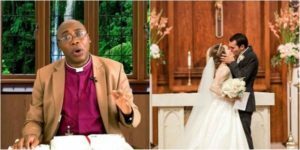 The Bishop of Niger Delta West Diocese, Emmanuel Oko-Jaja, has stated that the act of a groom and bride kissing during their wedding ceremony at the altar is a sin. Bishop Oko-Jaja gave the admonition recently in a sermon during the child presentation and thanksgiving service of the baby, Woyengilayefa Godfriend Atasiat at St Mark’s Anglican Church, Biogbolo in Yenagoa, Bayelsa State. According to the cleric, couples kissing during their wedding is unscriptural and should be discouraged. The cleric stated that the practice taking place in churches during matrimonial services promotes immorality and can corrupt the mind of teenagers and young adults that are witnesses to the practice. He opined that the act of allowing a groom kiss his bride in the full glare of both the young and old persons emanated from the teachings of false prophets.